Many of the people who have chosen to make Ibiza their home have a connection or history with the island. Many of us have danced our cares away across various dance floors on the island. However we came to be here, we all share one thing in common. A deep recognition of the healing power of this tiny island in the middle of the Mediterranean Sea. But why is it so special? Ibiza has many magical and mystical spots, each said to have their own healing powers and spiritual qualities, and so many people are drawn to the island when seeking solace and comfort, or are looking to transform their life. Some of the most renowned healing spots are.. 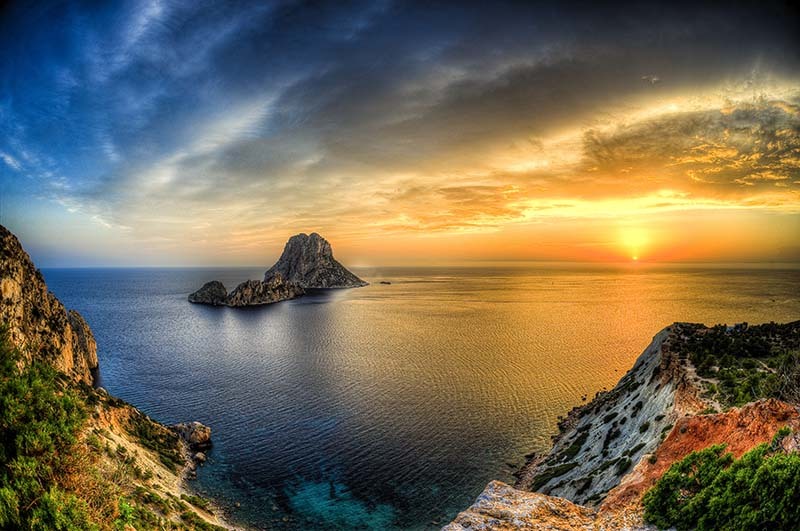 The most famous and mystical point on our beautiful island, Es Vedra has a quiet, majestic aura all around it. According to ancient legend, it was the holy island of Tanit, who came to Ibiza as Phoenician goddess of fertility and heavenly mother and became Ibiza’s most revered goddess. The sight of this imposing rock towering 400m above the sea will stay in your heart forever. It is also said to be the third most magnetic point on Earth, which may explain its phenomenal spiritual attraction to the hundreds of visitors who flock to the shores of Cala D’hort each year to admire its power and beauty. Tanit´s image can be found in many places across the island, from private pieces of art adorning the walls of hotels and villas, to ancient carvings to be discovered in mystical places such as Atlantis, Es Vedra and most of all, in the historical cave hidden deep into the rocks on the road to the beautiful bay of Cala San Vicente, where settlers created a temple for their Goddess Tanit many thousands of years ago. A visit to Tanit´s cave is often a popular choice on our group retreats, with so many women feeling an almost inexplicable connection to the island and her femininity, and many beleive that visiting her can aid fertility problems. Should you wish to discover more about Tanit, and unleash your inner warrior woman, then contact us now to reserve your space on one of our life empowering retreats. The area known as Atlantis is steeped in legend and mystery. Originally the ancient site was used as a quarry by the Phoenicians , and it is where most of the stone to build the Dalt Vila was sourced. Today you can still see many ancient sculptures and carvings of Buddha and the Goddess Tanit around the walls. Atlantis is difficult to find, as it is not signposted, but the natural formations of the rocks and surrounding scenery offer some of the best photographic opportunities anywhere on the island. Some boat charter companies offer trips by sea, or you can reach it from the road near to Sa Pedrera, but be warned it is a steep climb and not for the faint hearted. The area is said to have natural healing powers and indeed there is a definate aura in the air which is impossible to ignore when you visit this mythical spot. It´s little wonder then that Ibiza has become a permanent home for the host of wonderful, talented teachers and therapists who have chosen to make there life and practice here. To have all this knowledge and experience in one place is simply miraculous, and at Ibiza Retreats we are lucky enough to work with a handpicked selection of the most trusted and skilled healer and lightworkers on this magical island. Make this year count for YOU. Come and allow the natural beauty of Ibiza with all her magic heal you from the inside out. Choose from one of our group retreats to make this the year you truly shine..
3 Steps for empowering your LIGHT February is the new January!